With the holiday season fast approaching (or some would say already here), I wanted to take one last look at fall. We’ll be having a big family party here Thanksgiving weekend, so I’m holding back on the holiday decor until after the event. 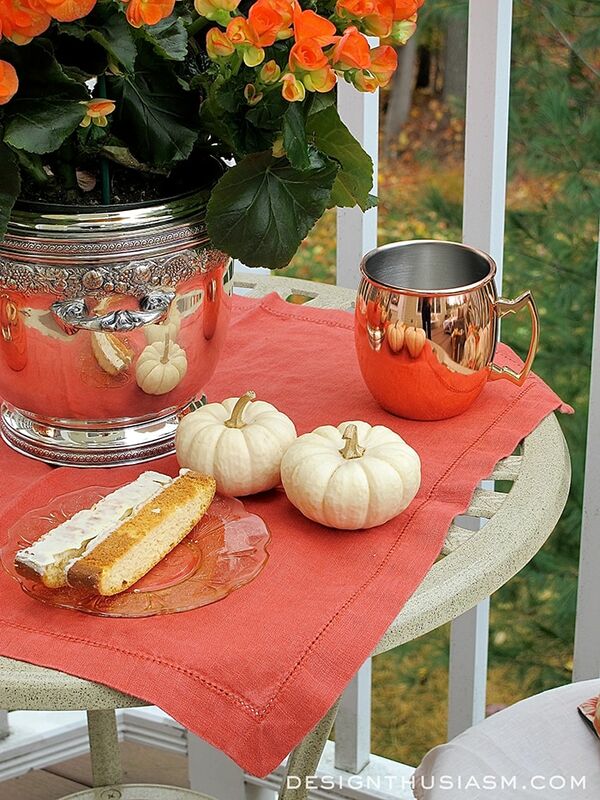 Last week I showed you our patio in full fall regalia, but I didn’t get to include the other side of the terrace. 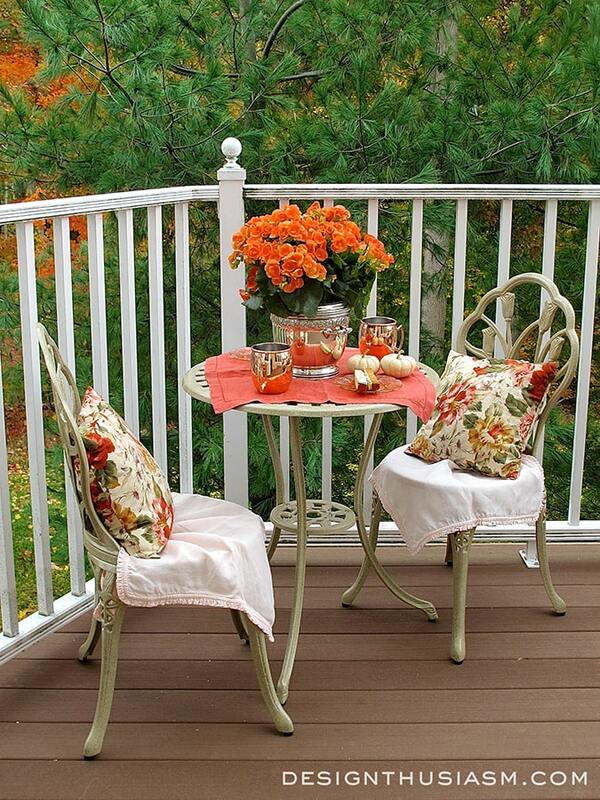 If you missed the last post you can see it here: Autumn Charm on a Townhouse Patio. While most of the space is set up for relaxing conversation on a big sectional sofa, this side of the patio is home to our little bistro set (which is super cheap on Amazon now due to end of season sales). For larger casual gatherings we can eat around the coffee table, but when it’s just two of us and we prefer the more comfortable height of an actual table, this sweet little table is the perfect spot. In summer I keep blue and white chair pads on the little seats, but for this autumnal setting, I chose more seasonal colors. The set is so tiny, a lush linen hemstitch napkin from Pottery Barn is enough to serve as a sort of tablecloth. Floral pillows from Ralph Lauren add comfort to the seats. At this time of year it’s beginning to get cold, but for a bit of fresh air, a quick afternoon snack of tea and biscotti always hits the spot. The pink depression glass plates are from a local antique shop, as is the silver ice bucket, used as a planter. 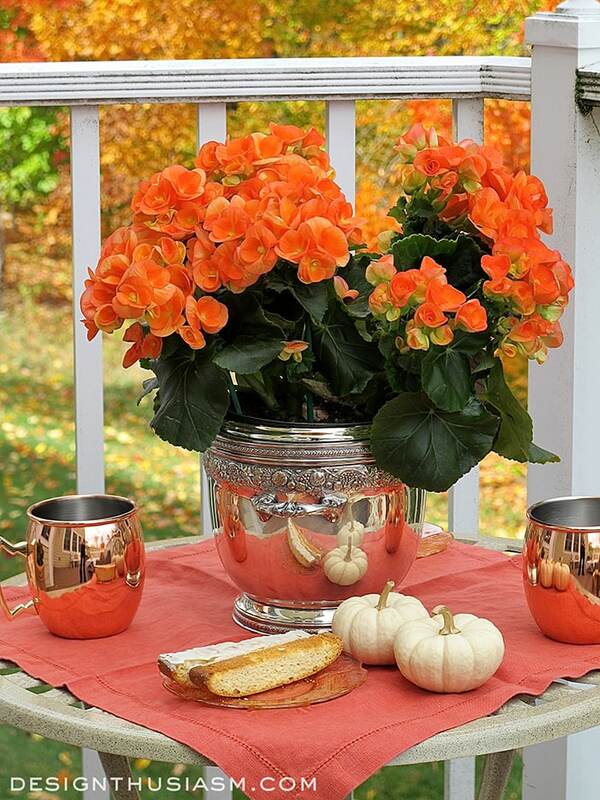 Also used are the ubiquitous copper mule mugs, available at Amazon, which have charmed me this year. 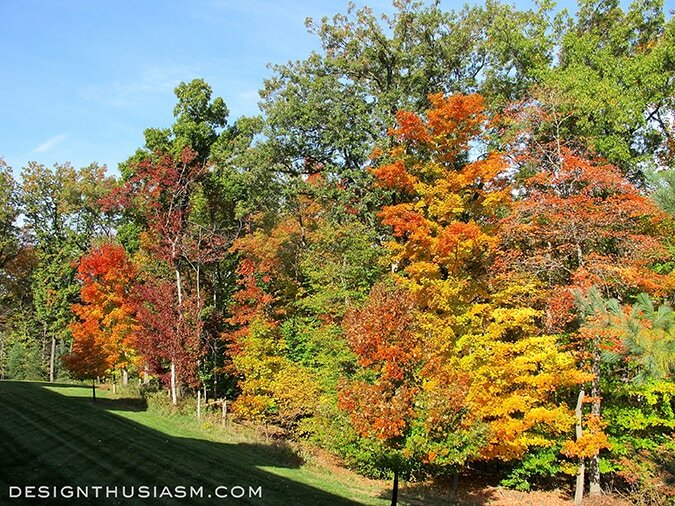 We are well into the season now, so the foliage is richly colored. This view from my patio is an utter delight. I was amazed at how much furniture we could fit onto our terrace. What initially seemed limiting, turned out to be quite a useful space. The begonia in the planter made its first appearance on my Halloween table which you can see at this link. It’s actually hard for me to believe I used to have to drive a ways to get this kind of view during foliage season. I’ve come to appreciate my little townhouse patio! Even the view from inside is joy to wake up to. 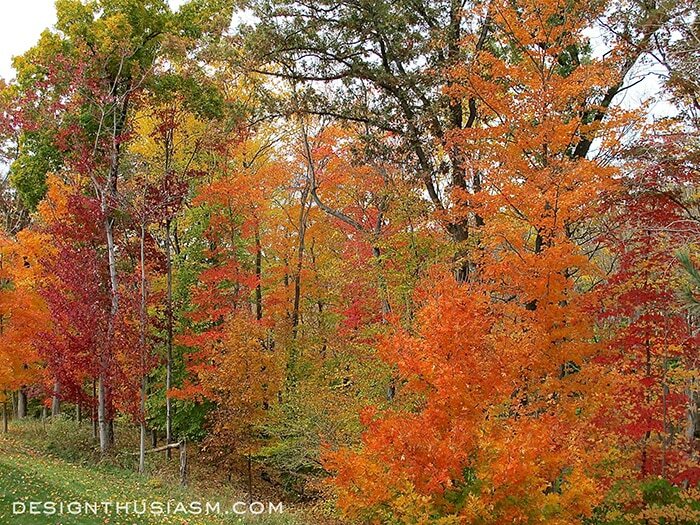 In another few weeks the trees will be bare, but for now, the riotous color is invigorating. Ok… now I think I’m ready for the holiday season. Maybe one more post on Thanksgiving tables, but very soon, I’ll be looking towards December! Linking with BNOTP, Dwellings Amaze me Monday, A Stroll Thru Life Tuesday, The Scoop, Savvy Southern Style Wednesdays, Pocket of Posies, Jan Olson Thursday, Share Your Style Thursday, From My Front Porch to Yours, The Creative Exchange, Feathered Nest Friday, Romantic Home Friday, Shabby Nest Frugal Friday, One More Time Events, Crafts a la Mode Weekends, Sundays at Home. Look at that beautiful fall color. What a view to enjoy your little spot for a snack. Yes, thanks, Kim! I can’t take credit for what nature serves us, but I’m delighted to do my best to enjoy it and share… 🙂 Thanks for visiting!! Aw, thanks so much, Pat! That’s such a nice thing to say… 🙂 Hoping you enjoy a wonderful Thanksgiving!! 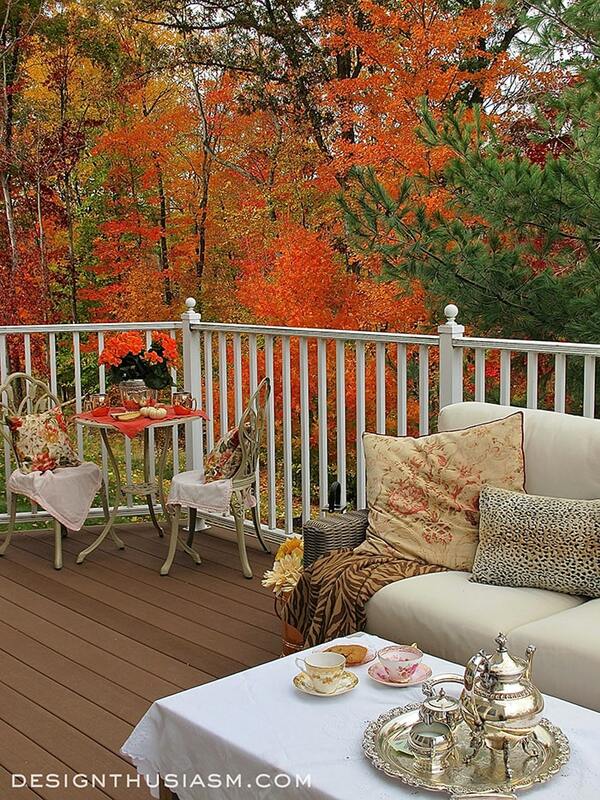 Absolutely stunning colors in the trees….I’m sorry but I think they upstaged your patio! :o) How wonderful to have these to enjoy….not something we see much of here in Southern California! 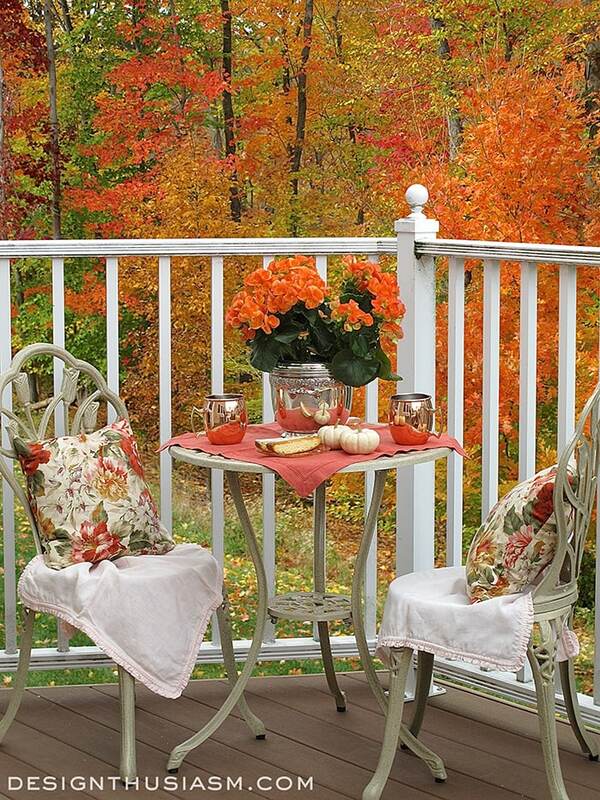 Lory, your deck is so inviting and the fall colors so beautiful–aren’t we fortunate to live in an area that gives us so much beauty in every season? Wishing you and yours much to be thankful for this Thanksgiving. Hugs! This is so gorgeous!!! Wishing you many blessings! Thanks, Susie! It’s already mostly gone in the past week, but now we can bring the party indoors… 😉 Thanks for visiting!! Have a wonderful holiday! Gorgeous Pam! What an amazing view to have. Lory, an absolutely gorgeous site for sure! 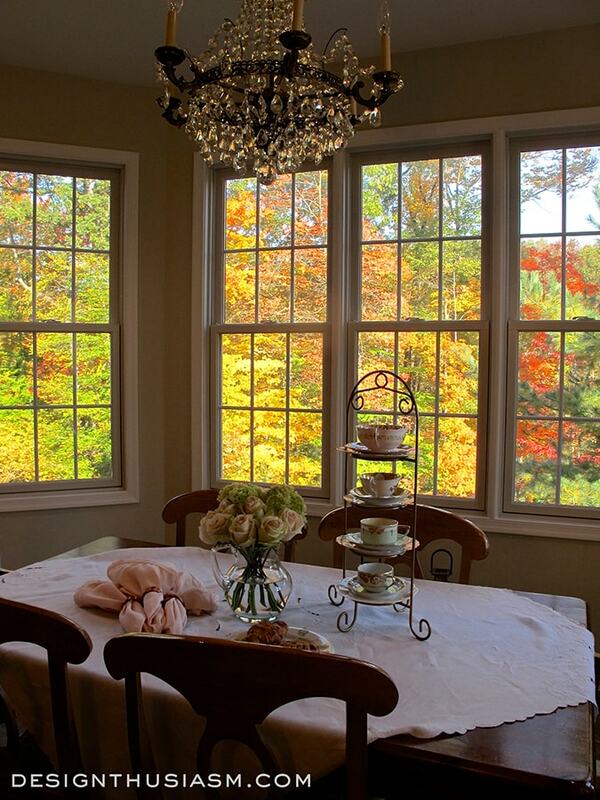 What a wonderful view to look forward to every fall. Thanks for sharing with SYC. 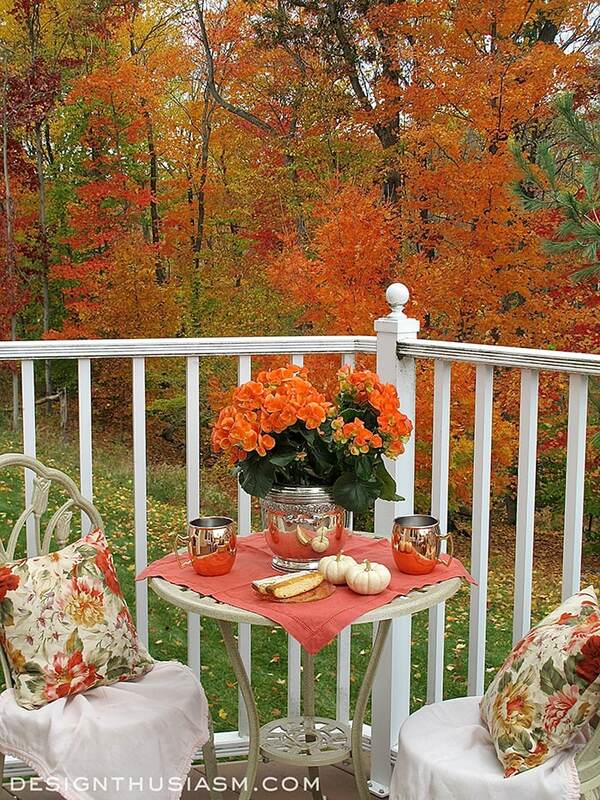 Your porch looks so inviting and your view is amazing. I don’t think I’d do anything but sit out there for as long as the fall colors last. Thanks, Eilis! Sadly, in one week they’re already almost all gone. But now we have the fireplace, so there’s that… 😉 Thanks for stopping by!